Beverley drums were originally made by Deans & Co., then in the Premier factory. When Boosey & Hawkes stopped manufacturing drums they bought Beverley but kept the manufacturing at Premier. This is actually the final version of the famous Cosmic snare, a direct copy of the Ludwig 400. 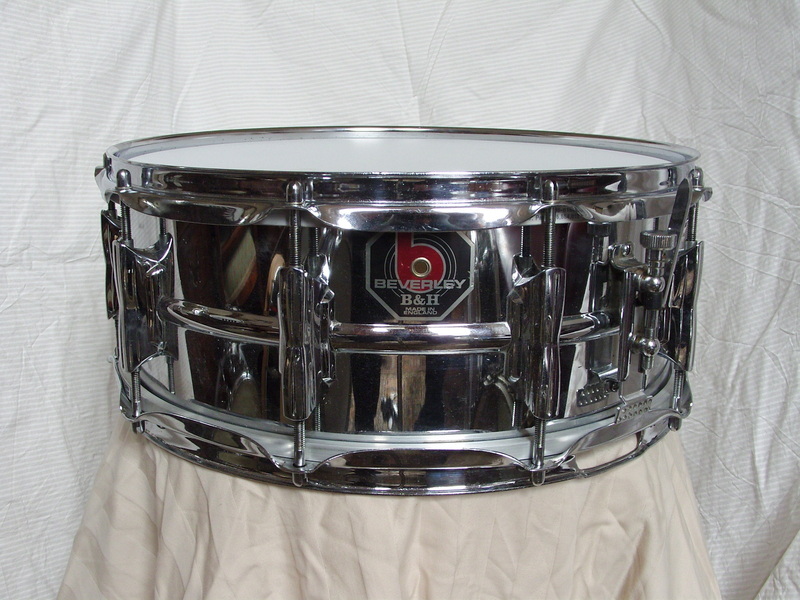 It was one of the first UK snares to have 10 lugs, a beaded shell (actually a 1930's Premier design) and triple flanged hoops. Like the 400 plating can be an issue but this one is mint. Shod with the appropriate Ludwig snare wires, this is indistinguishable from a 400, except it stays in tune.